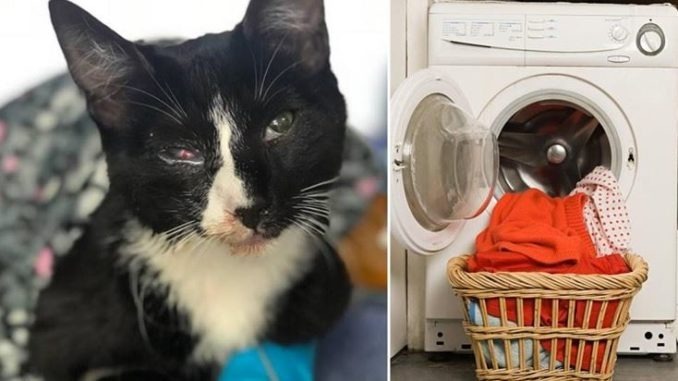 A six month old kitten was lucky to survive a full laundry cycle without even a single broken bone after getting caught in the washing machine. The kitten named Poppy , is now living a happy and a healthy life after being pulled out of a washing machine from her Australian home about a month back. It was a normal friday night when she was doing laundry and getting ready for bed when she realized she hadn’t seen their family kitten in a while. She looked for Poppy at all her spots at home, but she couldn’t find her. It was only when the washing machine completed its cycle and Burr went to take the wet clothes out that she found poor Poppy, dripping wet and barely conscious. Burr said the kitten must have jumped into the washing machine while it was still being loaded. The family immediately rushed Poppy to the Animal Medical Centre. The vet, Dr. Tim Laws said Poppy was severely concussed, with water in her lungs, head injuries and a body temperature below normal. Poppy was treated with IV fluids and sent home two days later.